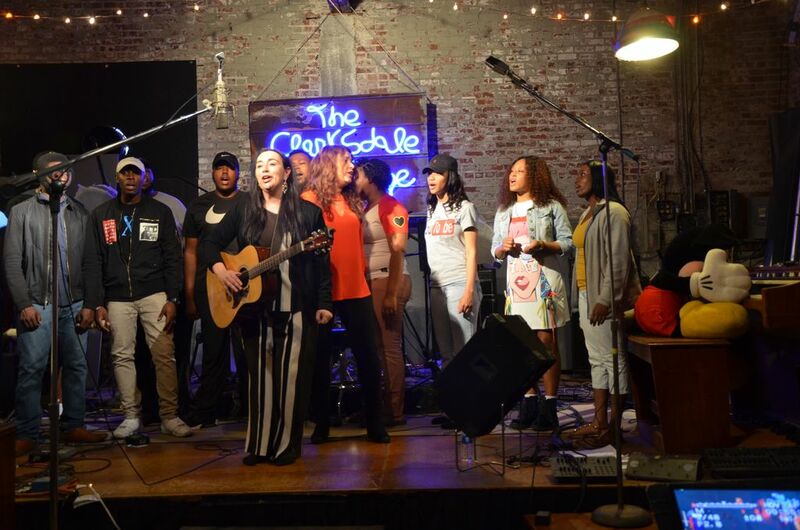 Norwegian Grammy Award-winning singer/songwriter Rita Engedalen (holding guitar), Margit Bakken, and 11 members of the award-winning Coahoma Community College concert choir under the direction of Kelvin Towers record Rita’s composition, ‘Heaven Ain’t Ready for Me Yet’ over the weekend at Gary Vincent’s Clarksdale Sound Stage Studio. The recording will be included in Engedalen’s album being produced in Notodden, Norway, Clarksdale’s international sister city and sister festival of the Sunflower River Blues Festival since 1996. The two vocalists were featured at the 2016 Sunflower with their ‘Women in Blues’ presentation. Engedalen also recorded earlier with two members of the CCC choir and with Chapel Hill Baptist Church soloist Myra Turner, cousin of Ike Turner.